"It's becoming more and more clear that the young universe was a big zoo with animals of all sorts," said Ivo Labb� (Observatories of the Carnegie Institution of Washington), lead author on the study announcing this result. "Overall, we're seeing young galaxies with lots of dust, young galaxies with no dust, old galaxies with lots of dust, and old galaxies with no dust. 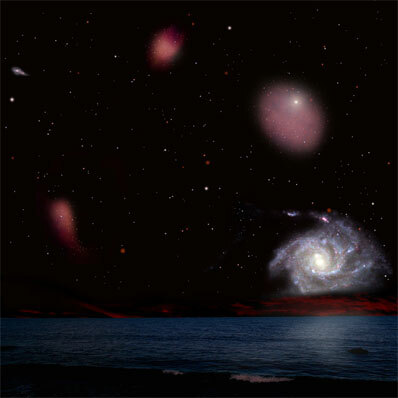 There's as much variety in the early universe as we see around us today," said Labb�. The team was particularly surprised to find a curious breed of galaxy never seen before at such an early stage in the universe-old, red galaxies that had stopped forming new stars altogether. Those galaxies had rapidly formed large numbers of stars much earlier in the universe's history, raising the question of what caused them to "die" so soon.